Many times, I think very frequently, we face problem with uninstalling a software. This happens on our development machine where we many times install/uninstall software, sometimes clearing the local MSI cache, uninstalling patches and of course registry corruption – all making it a nightmare when we simply want to uninstall by going to Control Panel – Add/Remove Programs. Recently we had an issue with uninstalling a software which was looking for MSI file and telling “The feature you are trying to install is on a network resource that is unavailable”. We ran this tool and it fixed the registry. 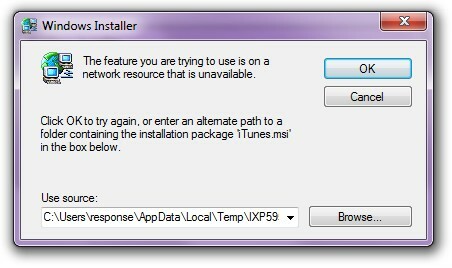 The software causing the problem is no longer listed in the “Installed Programs” list in Add/Remove Programs. Edit: Clicking ‘Accept’ in the screenshot above actually downloads the tool and at times there is difficulty in connecting – could be because of proxy issues or Microsoft server was down perhaps.